Figure 1: Phasor diagram, showing four coherent states with different values of α. Note that their field fluctuations are always the same. The state at the origin of the coordinate system is the vacuum state. i.e., as a coherent superposition of photon number states (Fock states). The complex parameter α determines the average photon number (which is its squared modulus) and the phase of the coherent state. where <n> = |α|2 is the mean photon number. 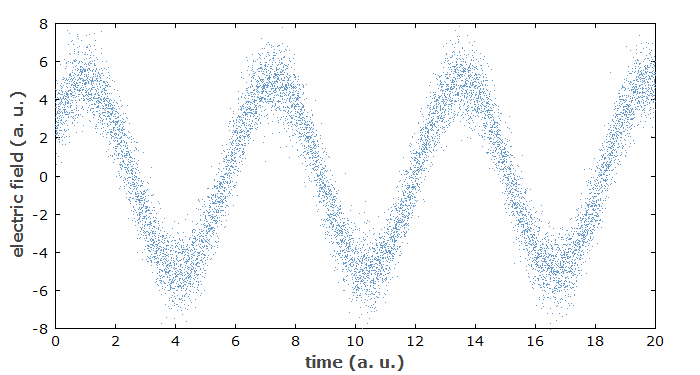 This shows that the coherent state exhibits Poissonian photon statistics. 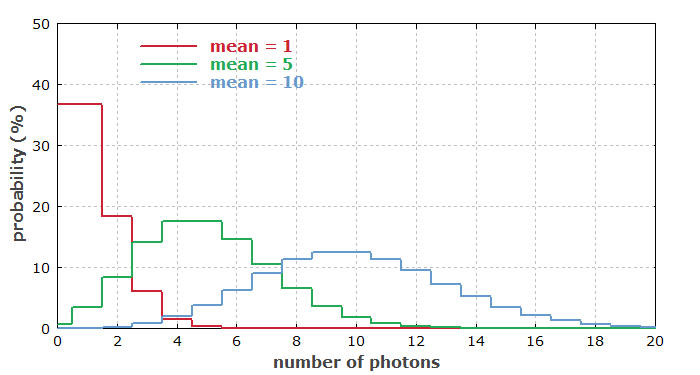 The figure below shows the distribution of probabilities for different mean photon numbers. For large mean photon numbers (e.g., well above 10), the distribution can be approximated by a Gaussian function, where the variance equals the mean photon number. Figure 2: Poissonian photon number distributions for different mean photon numbers. In some respects, the coherent state has properties which are relatively close to a classical state of the light field. For example, it resembles a classical oscillation of the light field, apart from some superimposed quantum noise, which is relatively weak for large average photon numbers. The quantum noise of the quadrature components of a Glauber state is equal. A nonlinear interaction can transform the circular uncertainty area into a deformed area with lower noise in one quadrature component; such states are called squeezed states of light. When such light fields experience linear losses, they are again pulled toward a coherent state. Figure 3: Electric field corresponding to a coherent state with a relatively small average photon number. 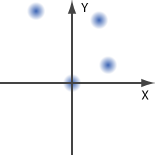 Each dot corresponds to one quantum measurement of the electric field (e.g. with homodyne detection). The magnitude of the fluctuations is equal for all times (phases). It would not change for a larger oscillation amplitude, which means that the relative amplitude noise would become smaller. The output of a single-frequency laser well above threshold can approach a coherent state, if the long-term phase drift (related to the Schawlow–Townes linewidth) is disregarded. This is valid for high noise frequencies. A special case of a Glauber state is that with α = 0. This is the vacuum state, having a photon number of zero, but still exhibiting quantum fluctuations of the electric and magnetic field, sometimes called vacuum noise.